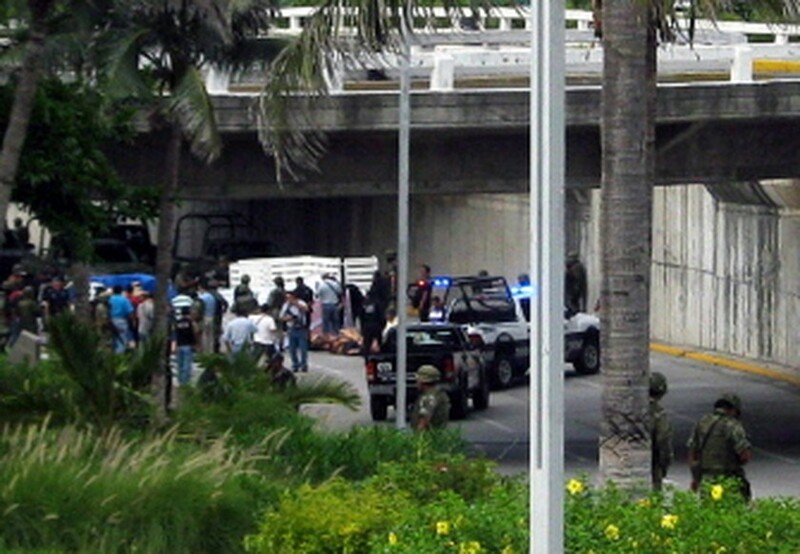 The bodies of at least 35 members of "a criminal organization" have been found in two trucks in Veracruz, eastern Mexico, justice officials said, adding that most of the dead were convicts. Veracruz state prosecutor Reynaldo Escobar told a news conference the cadavers were located Tuesday inside trucks at an underpass and that those so far identified had criminal records for murder, kidnapping and drug-peddling. General view of the scene where 35 bodies were found at the Adolfo Ruiz Cortinez Blvd in Boca del Rio municipality, Veracruz State, Mexico, on September 20, 2011. A source in the prosecutor's office said the dead were 23 men and 12 women. "At this time we have 35 bodies confirmed dead," said the source from Xalapa, the state capital, as local television showed some corpses dumped on the street and others in the trucks covered with blue plastic sheeting. The bodies were discovered one day after at least 32 prisoners escaped from three correctional facilities in Veracruz, 14 of whom were recaptured, according to authorities. Escobar however told local media that the bodies were not those of the prison escapees. The victims were all part of the same criminal organization, Escobar said without elaborating. Attacks blamed on the Zetas drug cartel have increased in Veracruz this year as groups have moved in from neighboring Tamaulipas state, authorities say. The Zetas, a gang of former Mexican special forces turned hired killers, are suspected of organizing prison escapes to get trained gunmen for their ongoing battles against rival drug gangs and the Mexican military. Mexico has been mired in a brutal drug war in recent years, with more than 35,000 people killed since the military launched a sweeping crackdown in 2006 against powerful cartels, which are themselves locked in fierce turf wars. The cartels have carried out mass kidnappings, torture, executions and other macabre displays of brutality in their struggle to control lucrative drug routes from Central and South America north to the United States. The Mexican Navy said earlier on Tuesday that it had apprehended 19 suspected Zetas members, including seven teenage boys and girls, at an apparent training camp in the northern state of Nuevo Leon. Mexican authorities have claimed a series of arrests in recent years, including of several top drug traffickers, but such operations appear to have had little impact on the violence gripping large swathes of the country. The Zetas have been blamed for the torching of a crowded casino in Nuevo Leon last month that killed 52 people, one of the deadliest attacks in recent memory.